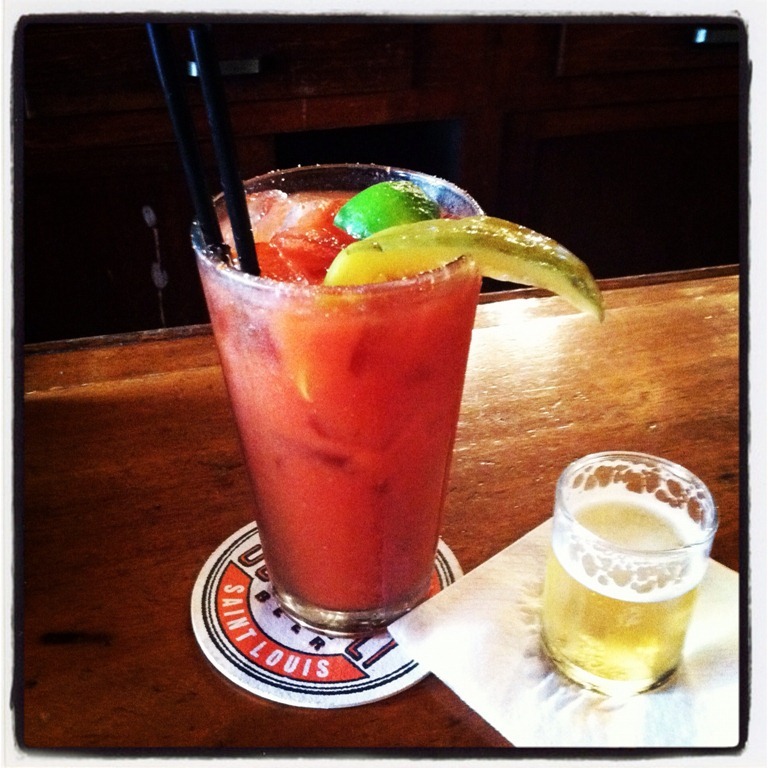 Sunday, Bloody Sunday | Eat It, St. Louis! The Bloody Mary was built for Sundays. Maybe it’s because of the tomato juice or the salad-like garnish, but a Bloody Mary always makes me feel like I’ve done something relatively good for myself. And isn’t that what Sunday is all about: restoring our selves and restoring our souls? When I’m looking to do a little restoration, I head over to The Famous Bar* and order up the La Cajun. This version of the Bloody Mary is my favorite, although they offer several variations. It’s spicy without being over the top, and the beer back (which is an ice-cold shot of Bud Light) is a brilliant addition. You can drink the beer along with your Bloody Mary, or pour it in for a Bloody Beer effect. Depending on the day, I’m apt to do either! The La Cajun is at the top of my hit parade because of its depth of flavor. William Kunderman, one of the awesome bartenders at The Famous Bar, was kind enough to share with me – although not in proportion detail – the secrets of this spicy, shake-the-cobwebs-out Bloody Mary. Of course there is the usual tomato juice (Campbell’s is The Famous Bar’s preferred brand) and vodka. The drink takes a spicy, and perhaps even a little bit of a meaty turn when he shakes in some A-1 Sauce, adds a dash of Worcestershire sauce, freshly cracks black pepper, tap-tap-taps in the Tobasco sauce, and adds a zesty zing with sprinkles of celery salt and Cajun seasoning. The Cajun seasoning and Tobasco are then deftly mixed to rim the pint glass that holds the boozy La Cajun salvation. When it comes to the garnish, The Famous Bar knows what it’s doing. Although pictured here with a Freestone Pickle (holy moly was that a good pickle) the La Cajun is traditionally dressed with Dano’s Pickled Green Beans. When I visited, William was waiting for a batch of the beans to arrive from Louisiana. Truly, I could eat those green beans by the handful! If you’re feeling the need to restore, refresh, or even reboot for the week ahead, make plans to head to the Southtown neighborhood for the La Cajun. Enjoy a Sunday Happy Hour (they open at 3:00), then head to one of the great neighborhood restaurants (like Pueblo Solis) and Eat It, St. Louis! * The Famous Bar is a special place for me. It’s where Mark and I had our wedding reception (things are different when you get married the second time). It’s where I did a red-wine spit take on a good friend, and I’m still apologizing for that. It’s been the site of so many good times with so many friends. Everyone should have a place like this in their neighborhood. Ah, a Bloody with a beer back! Years ago I used to be in the hotel business, and I was assigned to manage a hotel in Milwaukee my company had just acquired. The bar of that hotel always served its Bloodies with a beer back (2 ounces, I think; 4 at the outside). First time I ever saw it, and it’s a great idea — the flavor go well together. I actually have a few of those little beer glasses from that hotel — and use them every time I serve Bloodies. Which has been a long time now! Time for another! Thanks for a fun post. I love your comments, Kitchen Riffs! Clearly, your experience with food and drink, and the love of it, is honest. Your kind remarks always keep me motivated to write. Thank you. Great article Amy! I enjoyed reading it. I can attest to the deliciousness of the La Cajun. And it was great meeting you and Mark there. Hey, Jori: We had a blast meeting you, and we were glad you could join us. Perhaps we can make some time to do it again? Lots of great places in the neighborhood! My first time here and glad that I did skip over. We moved to STL a little over 4 months ago and reading posts like this make me know my new city better. Thanks for the fun post. I’m sure I will be back. I’m so glad you enjoyed what you read. I hope you visit again, as there will be more and more as time goes on. It’s local, it’s fun, and I hope that you find something worthwhile here. Cheers!